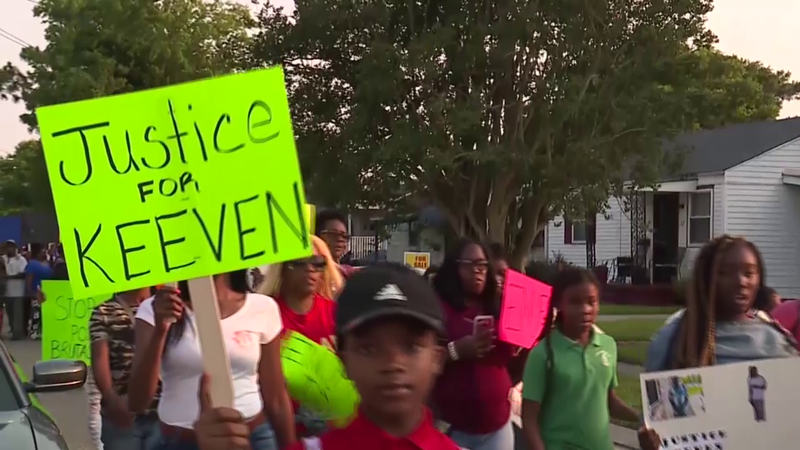 NEW ORLEANS -- More than 100 people marched in a New Orleans suburb in remembrance of Keeven Robinson -- a 22-year-old man whose death after a struggle with sheriff's deputies has been classified as a homicide. Four agents have been placed on desk duty as the investigation continues, reports CBS affiliate WWL-TV of New Orleans, Louisiana. Monday night's march happened after authorities in Jefferson Parish announced preliminary autopsy results indicating Robinson had signs of trauma from pressure on his neck and that he died of asphyxiation. Coroner Gerry Cvitanovich said the injuries were "consistent with compressional asphyxia." Complete results -- including toxicology reports and examination of microscopic evidence from Robinson's lungs -- will take weeks. "That said, I don't want to delay disclosure regarding the direction in which we're heading from Mr. Robinson's family, the sheriff's department or the media," Cvitanovich said. He added that he had shared the preliminary findings with Robinson's mother prior to a joint news conference with Jefferson Parish Sheriff Joe Lopinto. Lopinto said Cvitanovich told him of the autopsy report Saturday. He said the four deputies involved in the arrest have been read their rights and are cooperating in an investigation that involves his office, state police and the FBI. "I understand that this investigation will be under a microscope," Lopinto said. Hester Hilliard, an attorney for Robinson's family, said the sheriff and coroner have acted with "professionalism and transparency." However, she also said the family would like to see an agency other than the sheriff's office lead the investigation. Lopinto declined to immediately identify the deputies. He confirmed they are white. Robinson was black. "There's no doubt they used force," Lopinto said. "It's whether the force was excessive." Monday night, New Orleans media videos on social media showed marchers carrying signs. One read "Enough is Enough." Another said "Justice for Keeven." Some marchers were heard singing "Amazing Grace." "For me it means unity, coming together and pretty much just supporting the family," Regina Hollins told WWL-TV. WWL-TV writes that the march stems from Robinson's death last week from injuries he sustained during a struggle with Jefferson Parish Narcotics Detectives. Robinson was allegedly being investigated for drugs and was spotted at a local gas station when he took off in his car. It was about a block away from the gas station when detectives caught up with Robinson that the fatal encounter took place. The station also adds that the march came hours after the coroner released Robinson's autopsy that stated he had traumatic injuries to the soft tissue of his neck and that his death was caused by the actions of another. Lopinto said it was too early to conclude whether a choke hold was used. Officers are not expressly forbidden under department policy to use choke holds, but they aren't trained in them either. "From a policy standpoint, we don't train somebody to hit someone with a brick," Lopinto told reporters. "But if you're fighting for your life and a brick's there, you hit someone with a brick." Lopinto said Monday that Robinson was unarmed when he was detained. He said there was a gun in Robinson's car and that he had heroin on him. So far, no video has surfaced. The Jefferson Parish Sheriff's Office doesn't use body cameras. Even if it did, Lopinto said, the deputies involved were undercover detectives. "Undercover narcotics agents would not have a body camera strapped to their chests," he said. Robinson's father, Steve Jackson, said "Enough is enough ... it's time for it to stop man." "At this time I'm lost for words," he added. WWL-TV writes that Robinson's grandmother said young black men shouldn't live in fear of police. "We want the young black men to be able to walk the streets and when the police do frisk them, we want them to be able to stand and let the police do their job," Sheryl Robinson said. "They're afraid of the police. They are killing our children. It's time to stop, enough is enough." Among those attending the news conference earlier Monday was Gaylor Spiller of the Jefferson Parish chapter of the NAACP. She said the organization was supporting Robinson's family and keeping an eye on the case. She credited Lopinto and Cvitanovich for being open about the autopsy results and the investigation. "We're here to support all sides," Spiller said. "I just want the truth."